We have a special treat for you in honor of Valentine’s Day tomorrow! We are providing a heart library with some updated information on what is so special about this library of designs as well as how to access and use them in the Embrilliance programs! 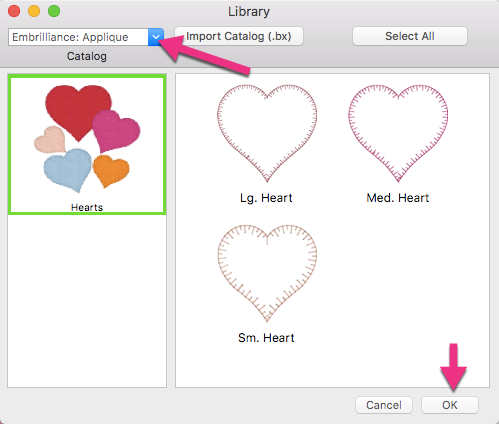 Here is a .BX file to install a heart design into the Embrilliance platform. If you don’t own Embrilliance, there is a FREE “Express Mode” that you can use. Download the Embrilliance Platform from Embrilliance.com/downloads. The download will be the first title, and you can choose Mac or Windows. If you are unable to download the BX file, you can try to download this zipped version. Please note that in order to install this BX you MUST take the extra step of unzipping this file. You can NOT install a zipped BX. HeartsBX – YOU MUST DOWNLOAD AND UNZIP THIS FILE!!! BX files will install themselves – that is what the BX format is! It is an installation file for the Embrilliance platform. Many of you are already familiar with the incredibly popular “BX font” which allows you to install a mapped alphabet design collection from your favorite digitizers into the Embrilliance platform. Once you install the BX, you can now access the “font” using the lettering tool! As a matter of fact, BX fonts have become the most requested file format in the embroidery industry! The BX file is an installation file – so in addition to installing “BX fonts” you can also install other types of content such as thread families and design libraries – also known as “Moddies” because these designs can be modified! 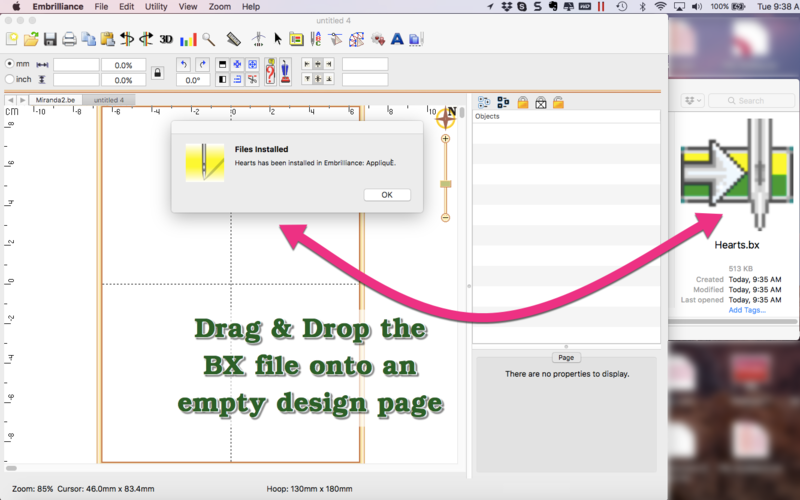 To install the .BX file in your Embrilliance, simply drag it from your desktop onto the icon of the program (if it isn’t running), or onto the main page (if it is running). You will get a confirmation screen that the BX file has been installed. To access files such as these in the Embrilliance Platform, use the Merge Design from Library button that is located towards the right side of the toolbar. It looks like a gear and as with all of our buttons, when you hover over them, their job is listed. This will open a dialog where you can choose Embrilliance: Applique from the Catalog pull down at the top left. Select one or more of the designs in this library and click OK. The “Moddie” applique design is inserted into your design page. We call this a “moddie” because when you select the design, in the properties pane, you have a tab that provides you modifiable features for this applique design. 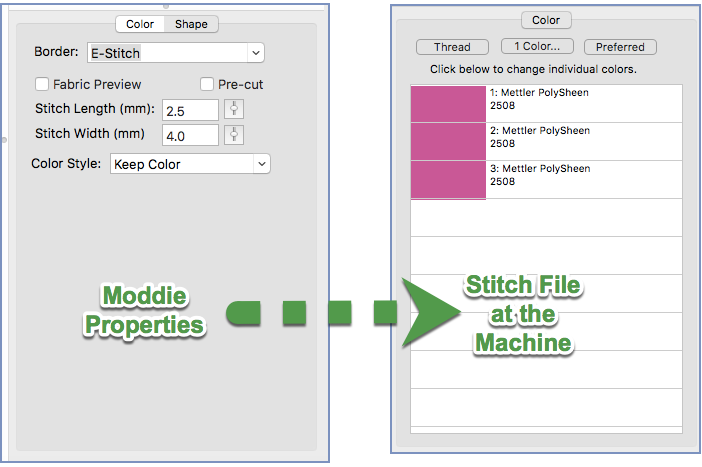 You can change the type of finishing stitch from the Border pull down menu and change its properties such as stitch length and width using the slider bars for each property. You can even preview a solid color fabric by selecting Fabric Preview! Under Color Style you can choose PES Card (traditional) which will set the colors of the applique position and applique material as the “traditional” named colors from the Brother thread palette. 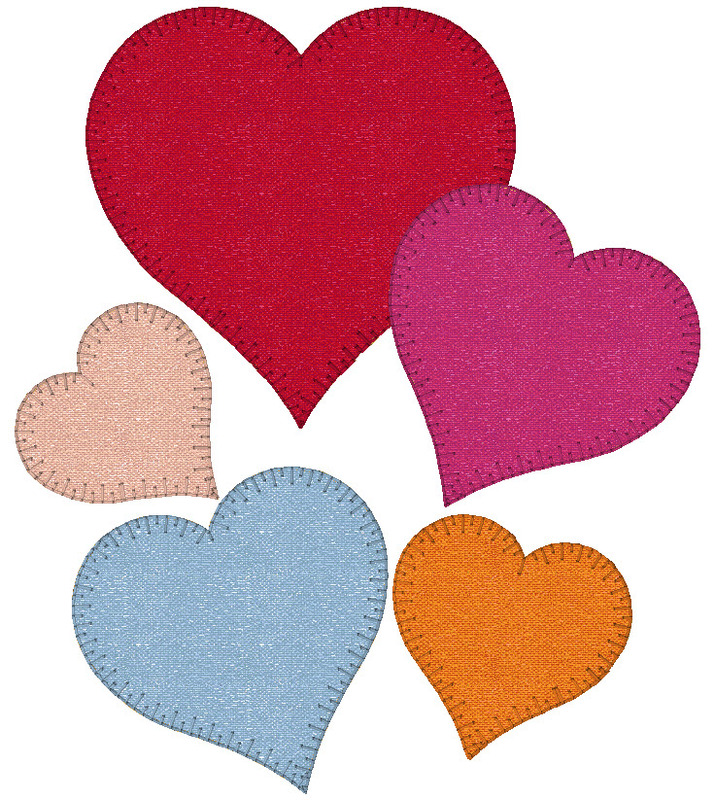 (See the picture below where we talk about creating cut files for applique cutting machines). 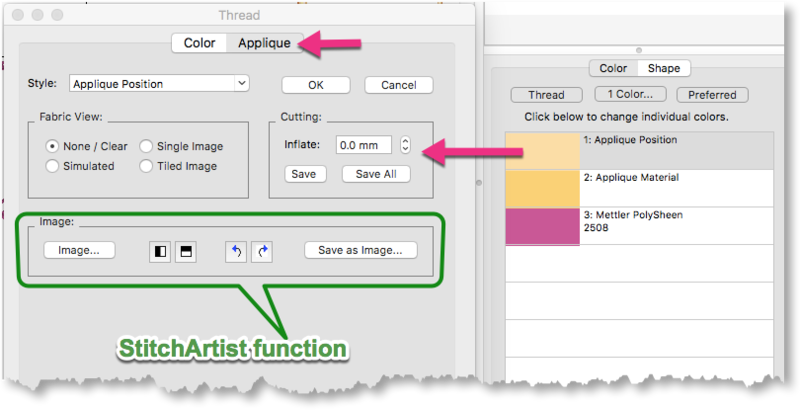 If you would rather have the machine prompt you for the same color for all three components of the applique, set the Color style to “Keep Color”. When you save the stitch file to send to the machine (in a home format that supports same consecutive colors), it will show the same color for the applique position, applique material and finishing stitch! This automated feature is the same as if you had manually colored the design and chose Keep Color Stop from the right click popup menu in the color properties pane. Don’t forget that you can copy/paste, rotate, resize etc. for your own layout. These “moddies” are object based designs created specifically for Embrilliance – so when you resize the “moddie”, the program uses the information/settings from the properties pane to recalculate the stitches of the objects. Its like digitizing, without having to digitize! You can even create cut files for an electronic cutting machine by selecting the applique position color chip. Here we have the Traditional PES Color Style for applique designs shown along with the dialog that you get by left clicking on a color chip and choosing the Applique tab at the top. Depending on the programs that you have authorized, your dialog may look a bit different than the one shown here. 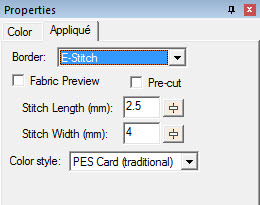 Yes, if you have StitchArtist authorized, you can add an image to be used as the “fabric background”. This image will be cropped to the shape and you can resize and move the image to fit the shape as you wish. 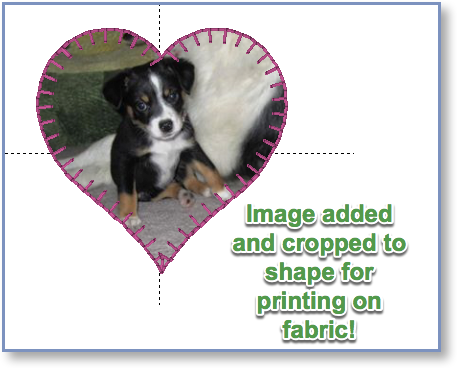 Yes, you can choose to print this cropped image onto photo transfer paper OR directly to fabric to use as a custom applique fabric! Once you are done playing – we mean once you have finished customizing your design layout, you may now save the stitch file in any format. The design can be saved for any home embroidery machine sold in the last 20 years! 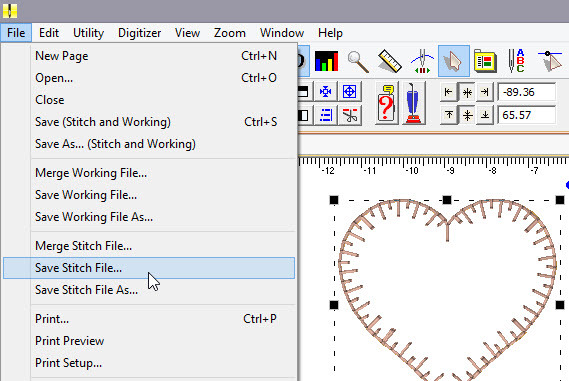 All you need is a way to get a design to your machine from a computer and you are good to go. We hope that you enjoy this lovable library and feature of Embrilliance! Posted 1 year, 2 months ago at 10:59 am.